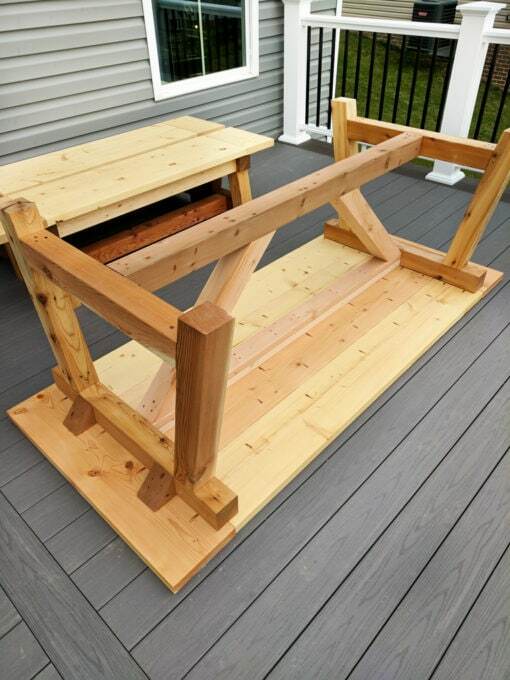 This DIY truss beam farmhouse style outdoor table and benches are perfect for dining and entertaining on a deck or patio! Friends! 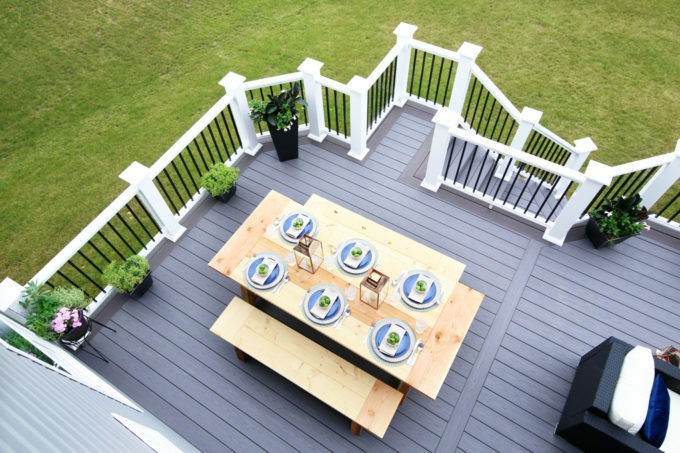 Thank you all so much for your kind words about our deck reveal last week! It was so fun to have people to share in the excitement with, and I am thrilled to be back today with more details about one of the things we’ve gotten the most questions about: our DIY farmhouse style outdoor table! As I was searching far and wide for the perfect table to use in our space, I came across this beauty from Restoration Hardware. I absolutely loved the style. I did not absolutely love the price. And even if I was willing to spend a hundred bajillion dollars on a table, theirs was not made to be used outdoors anyway, so I was out of luck. 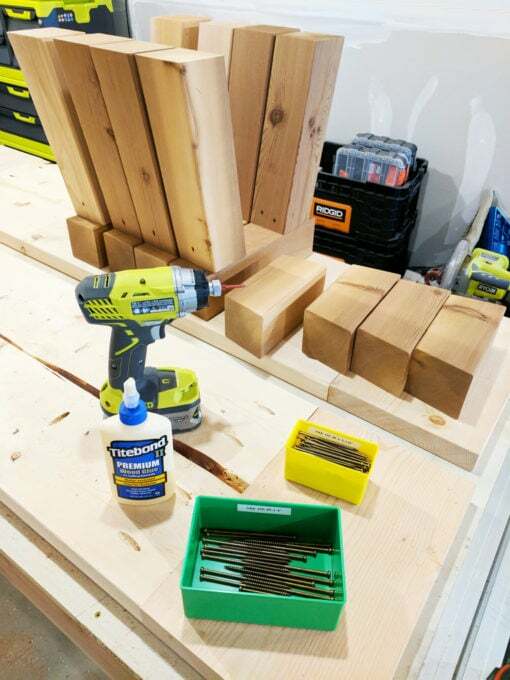 So I will let him take it from here and tell you all about the amazing table he built with his own two hands (and also power tools) because he is pretty awesome. Here he is! 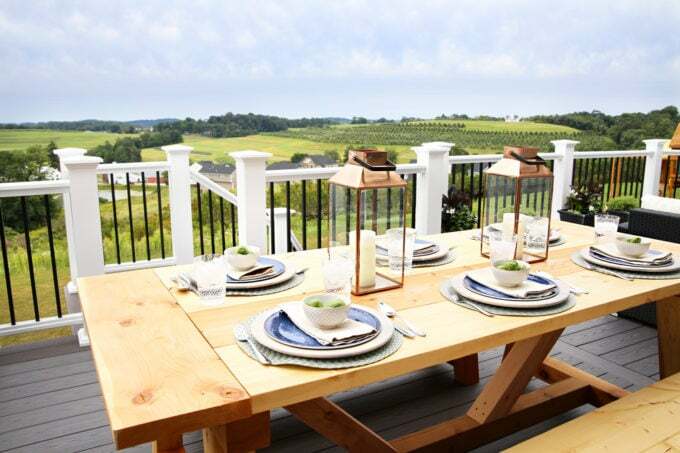 One of the things I was most looking forward to with our new deck was a nice, large table for family meals. I offered to build one, and Abby’s friend Jen Woodhouse pointed her to these Ana White plans for the style of table she wanted. Ana White created the plans and then collaborated with Shanty 2 Chic on the build. I adjusted the plans slightly to fit our space. We made our table 7’ long. 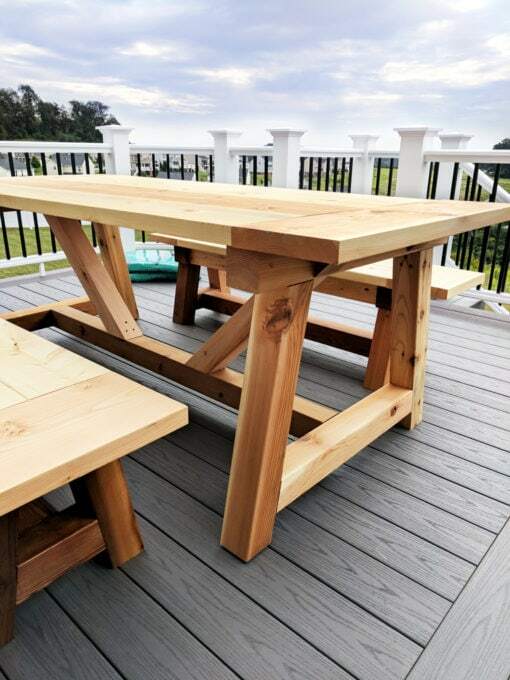 It really is amazing how much money you can save by building a table like this. At Restoration Hardware this table costs more than $2,000, but I was able to build ours for about $250 in lumber. 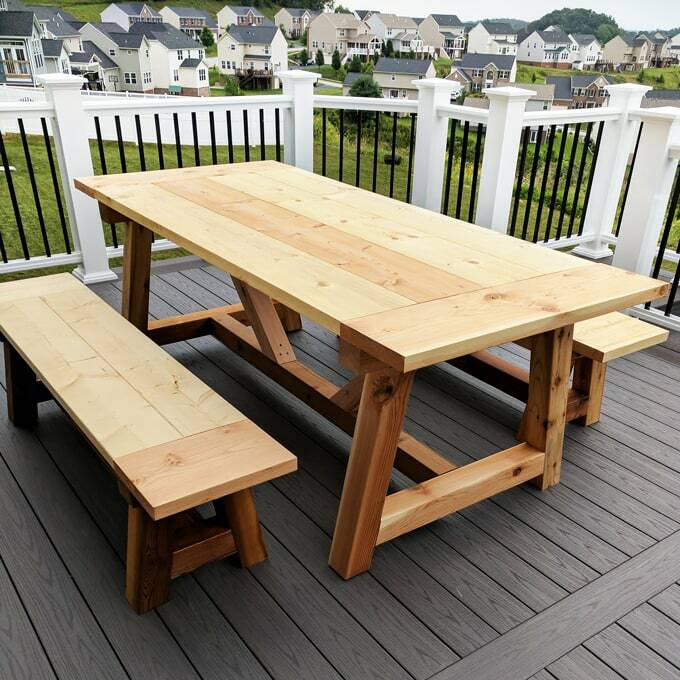 When I went to the lumber yard, they had just sold out of pine 4x4s, so I ended buying cedar 4x4s for the table base. 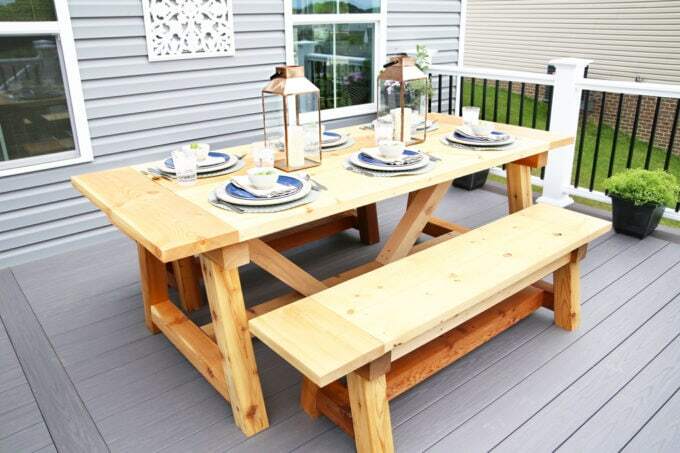 Cedar is a bit more expensive than pine, but it’s actually better suited for outdoor use. The table and bench tops were made out of pine 2x10s and 2x8s. These weren’t special boards, just standard framing lumber. I did spend some time looking through the pile for the straightest boards I could find. 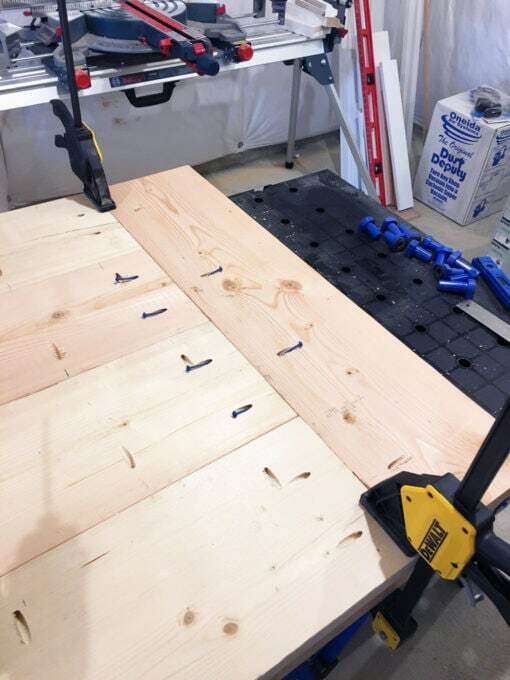 I joined the table top and bench top boards with pocket holes and screws using my Kreg Jig. 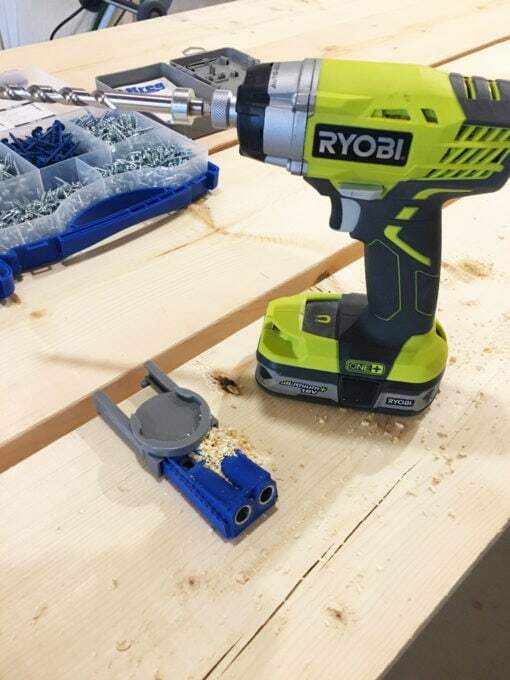 Ordinarily I would glue the joints as well, but I didn’t do that on the table and bench tops. The boards available at the lumber yard were pretty fresh, so I know there is going to be some contraction during the first year. I want the ability to take the table top apart next year and re-join if there is a lot of cracking or movement. Even without glue, the table top and bench tops feel incredible sturdy. 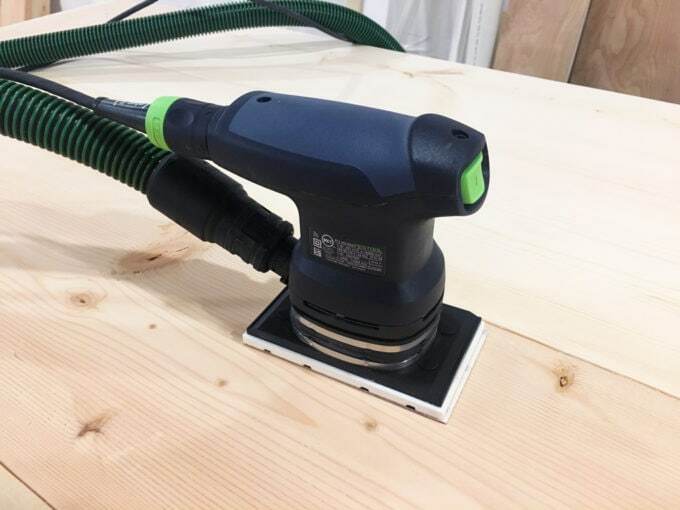 When sanding the tops, I worked my way down from a very coarse sandpaper to a very fine sandpaper. 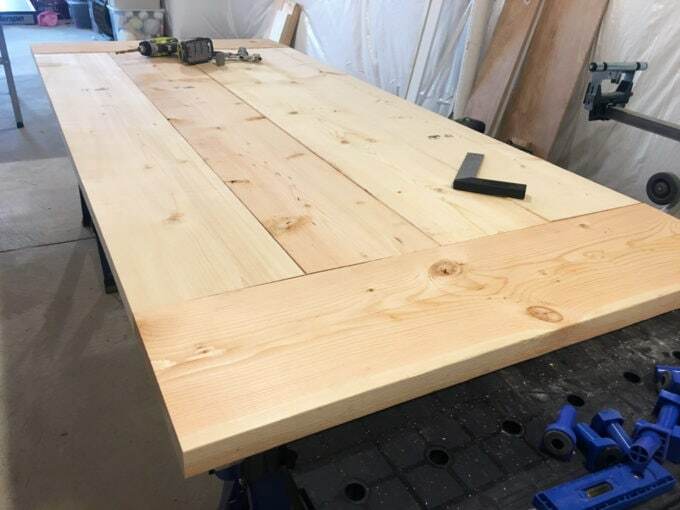 This table will be for outdoor use, so I didn’t finish it to the level I would if it was for a dining room or indoor use. 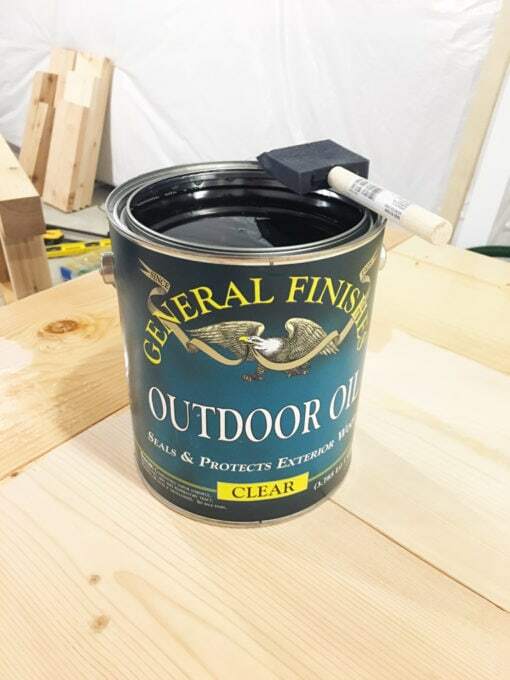 The finish I used on the entire project is General Finish’s Outdoor Oil, which was also a recommendation from Jen. It’s a little pricey at $60/gallon, but it’s going to last a long time for a lot of different projects. Originally, I thought about staining and polyurethaning the table, but Abby has two Pier 1 outdoor chairs that were oiled, and I love how they’re holding up. The Outdoor Oil really soaks into the wood, enhances the grain, and darkens the wood ever so slightly. It was simple to apply with a foam brush. Depending on how well the oil holds up outside, I may add another coat next summer. I followed Ana’s plans for the table and bench bases. I first measured and cut all the pieces with my miter saw. This table has a lots of ten degree cuts which gives the base a unique look. After all the base pieces were cut, I sanded everything the same way I did the table and bench tops. At first I wasn’t sure how how I wanted to join all of the support pieces. 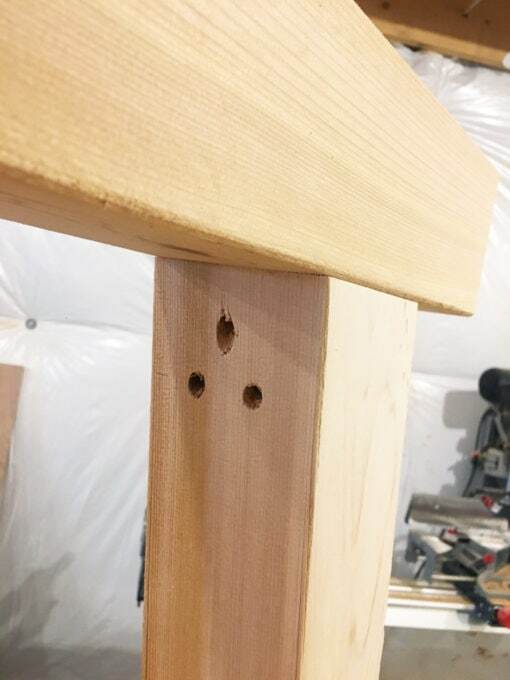 Instead of taking the time to drill pocket holes, I just used long GRK trim head screws at an angle and lots of glue on each joint. This method made the support assembly very quick. 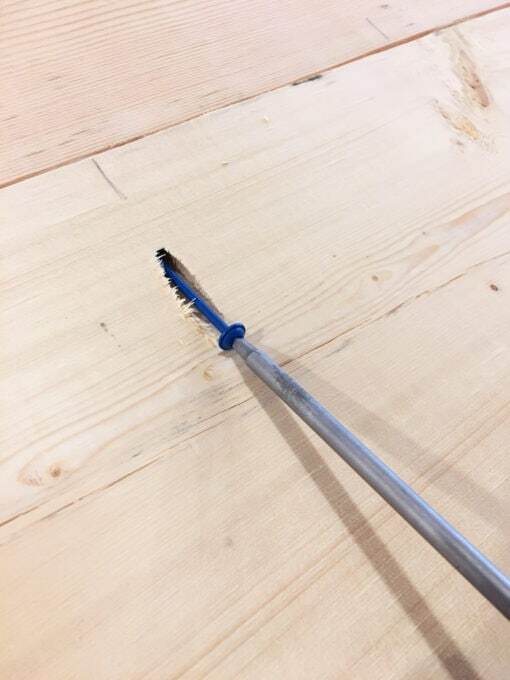 Once the trim head screws sink down into the wood, there is only a very small hole. I used three screws on each joint. 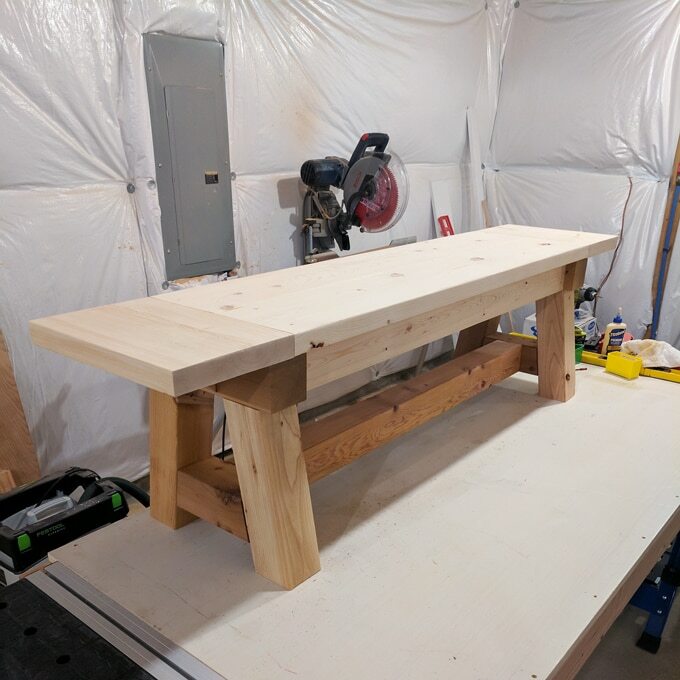 I built the table and benches in my little basement workshop. 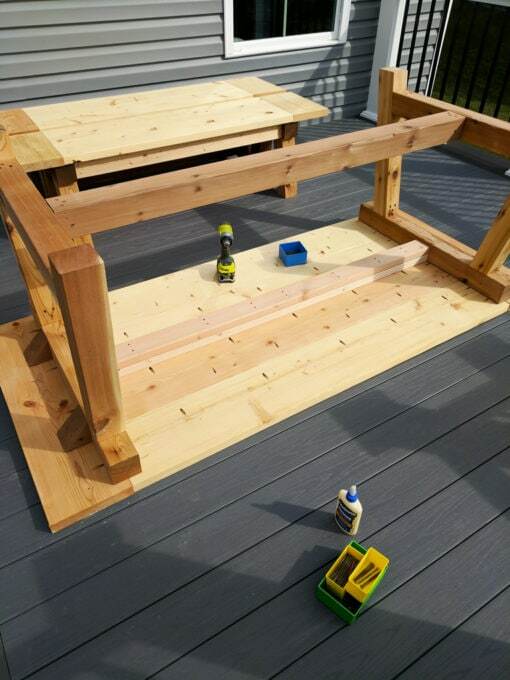 I was able to complete the benches and attach the tops in the basement and then carry them up to the deck, but I knew I would need to attach the table top to the supports outside on the deck since the full table would’ve been too big to carry up the stairs. Abby helped me carry the table top up to the deck where I attached the legs, then measured and cut the final support bar and angled pieces. During the table and bench build, I did notice that the bread-board ends were a bit wobbly and that made me nervous. 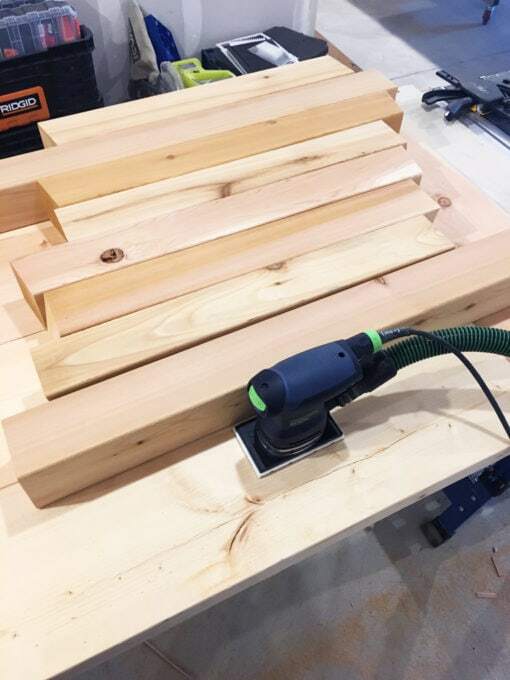 I solved this problem by cutting wedge supports out of my cedar 4x4s and attaching them to the understand of the bread-board. This extra support really made a difference. With all of my pieces securely fastened into place, the table and benches were complete and ready to enjoy! Isn’t he amazing?! I love how the table turned out, and don’t you worry, Donnie– I have plenty more project ideas where that came from! 😉 I had fun dressing up the table a little bit for the reveal post last week, so I thought I’d share a few of those pictures again! I love that we can fit a crowd around this table! We have two chairs in the living room that we could bring out and stick at each end to fit as many as 8. I see many get togethers happening out here in the future! Thank you so much for following along with our deck progress! It looks so great!!! I love Ana White plans! Thanks so much, Amanda! Me too! 🙂 Have an awesome day! This table looks great! I love Ana White’s plans as well. I just made a bed for our girls from one of her plans and it turned out magnificent as well. Thanks so much, Crystal! Yes, Ana’s plans are SO awesome! So talented. Have a wonderful day! Hi there! What angles did you cut your 4×4’s at? Beautiful table! Hi Lauren! I can’t remember what angle the plans called for. It’s all in the plan.